Long before I had ever started food blogging, I had already been acutely aware of the foodie scene and had made a bucket list of dream places I really wanted to go to, but had to save for a special occasion. 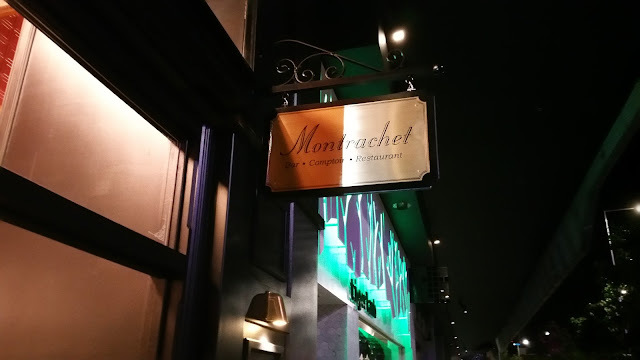 Top of my list was none other than Montrachet, the french restaurant which has newly been relocated to the hot foodie hub, King Street in Bowen Hills. 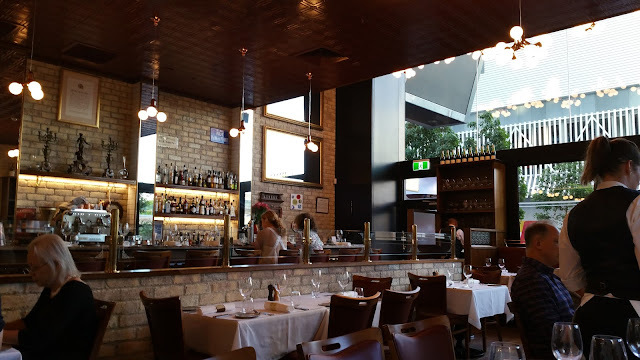 With my annual birthday celebrations on foot, two very dear friends offered to let me choose the place to have dinner, and I finally couldn't resist the temptation, and so Queen V made the booking. 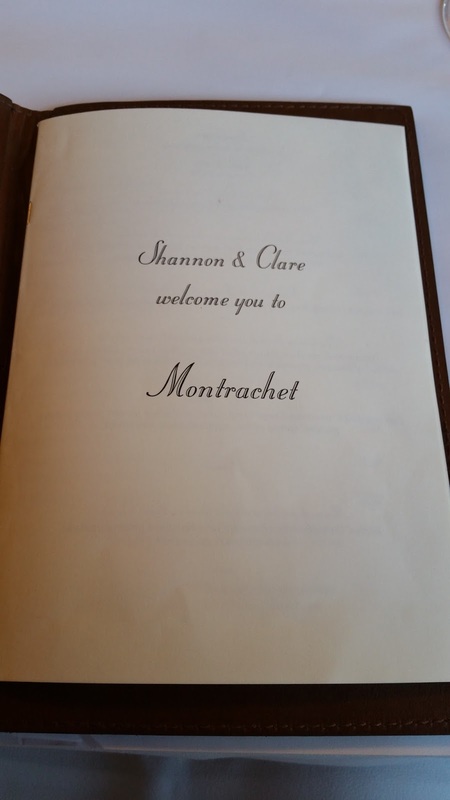 Upon entry, we were soon greeted by the friendly waitress and shown to our table. I really liked the simplistic yet very stylish decor. It reminded me a lot of the other French restaurants I had tried in Melbourne. The exposed bricks gave it a nice touch. 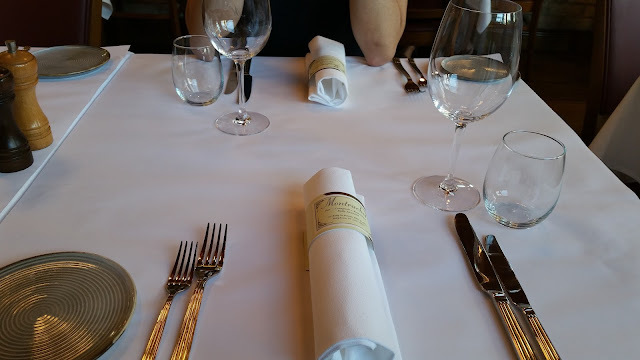 Given the business of the festive season, we were given a table that came with a strict two hour limit as the next table was due at 8 O'Clock sharp. Which is why we had all prepared ourselves accordingly by perusing the menu online before our arrival. Having said that, there is a certain charm to a leather bound menu, and I could not deny my excitement as I opened it and went through the extensive options. 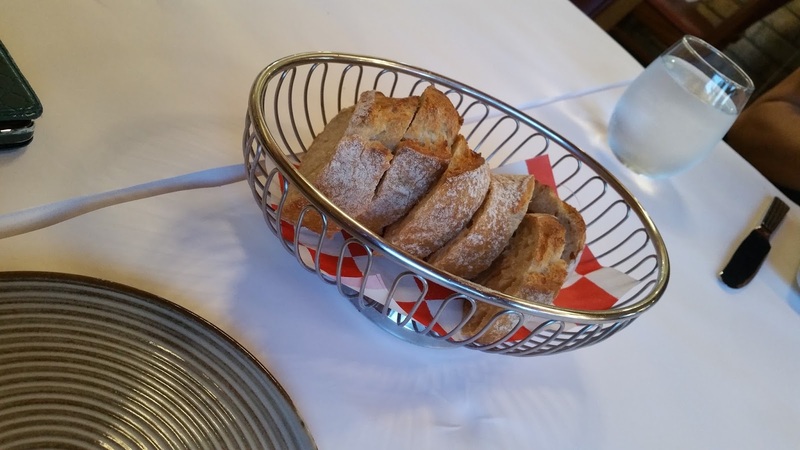 After ordering, complimentary bread was soon brought to our table. Strangely, butter had to be requested separately. I liked how the bread as slightly toasted, although it wasn't particularly crusty, the centre was definitely very fluffy. Before long, our entrees started to arrive. 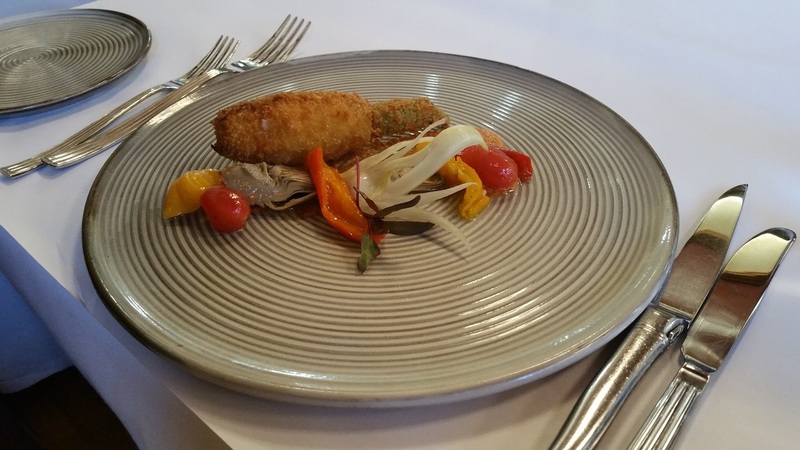 My first companion had the Zucchini Flower filled with filled with saffron risotto, sheeps milk cheese of Basque, romesco and crisp salad of sweet peppers and tomato. 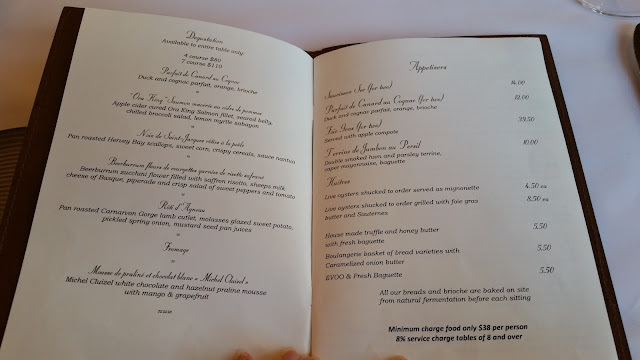 Despite how complex the dish sounded, it was a relatively simple affair, and my friend enjoyed the one single crumbed flower, but noted that even for an entree, there could have been a little more. 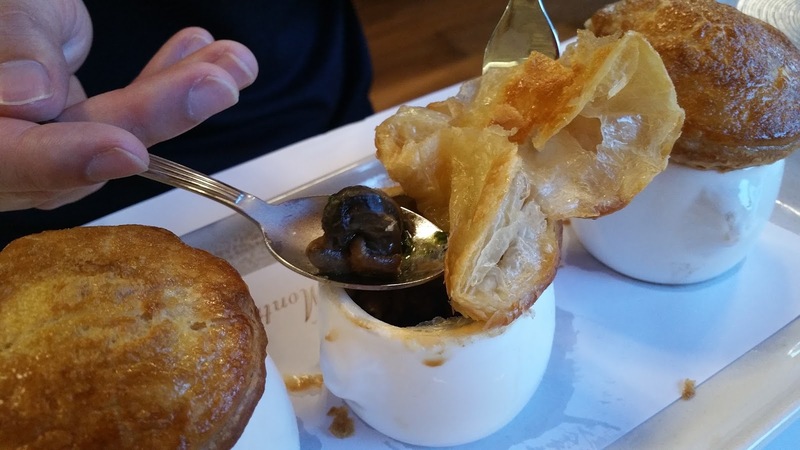 My other companion, wanting to go for the full French experience, opted for the Escargot - Snails baked in little pots with garlic butter, tomato, Spinach and topped with puff pastry lids. This was considerably larger in portion than the Zucchini Flower, and my companion found the dish to be very enjoyable, with the snails giving an almost seafood-esque flavour. The puff pastry was also wonderfully flaky and delicate, whilst the garlic butter, tomato and spinach gave the dish a very strong and distinct taste. My choice of entree was the Soufflé au Crabe et au Gruyère, a double baked soufflé with crab meat and gruyère cheese finished with a light cream bisque. 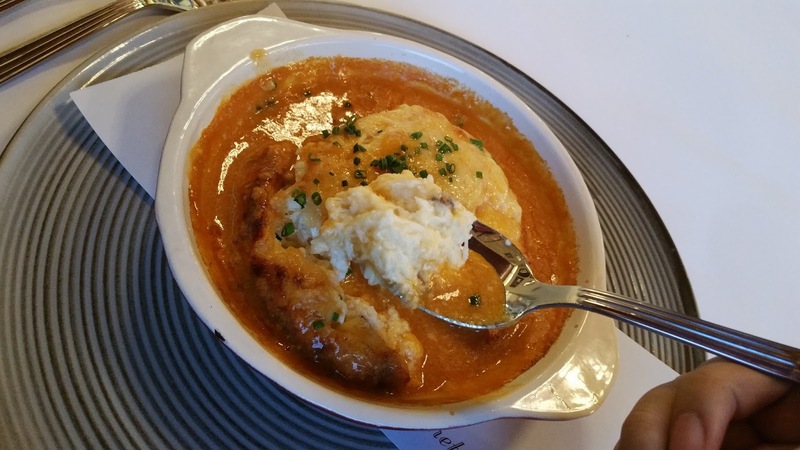 Of all our entrees, we all agreed that this was by far the best. 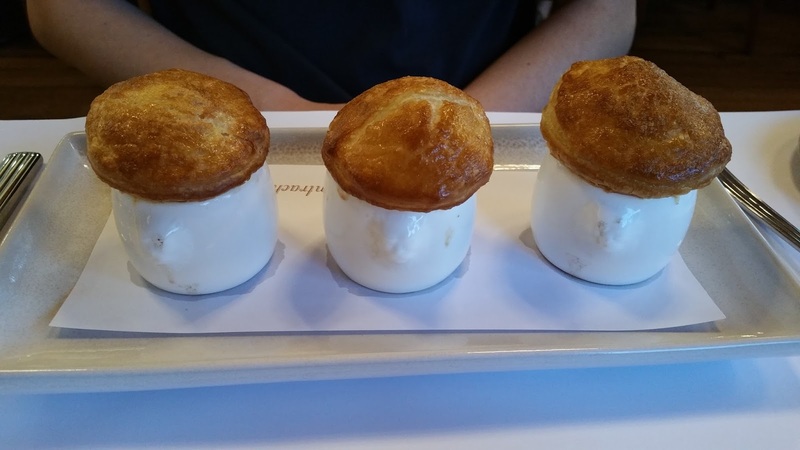 The souffle was wonderfully light, and the crusty gruyere outside gave it a delightful contrast. 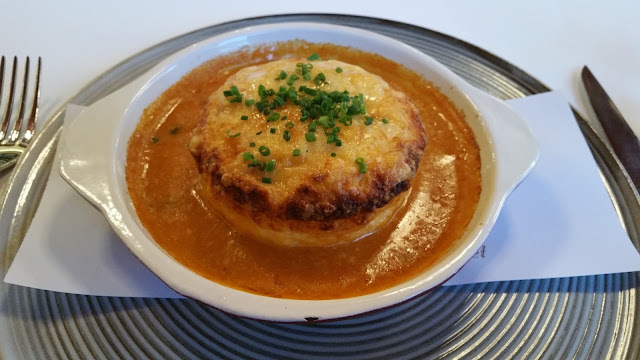 There was a generous amount of crab inside the souffle, which was complemented by the rich smooth bisque. I absolutely loved this. 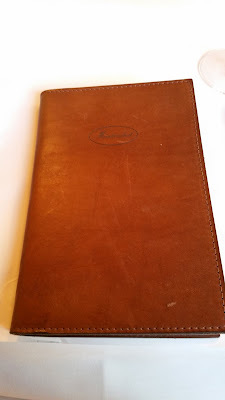 My companion who went full French had the Cuisse de Canard Confite et Poêlée, a Confit free range duck leg from Galston, caramelised onion tart, rosemary praline, celeriac and fresh broad bean. When he started gushing about how good it was, I knew that I had to try some. 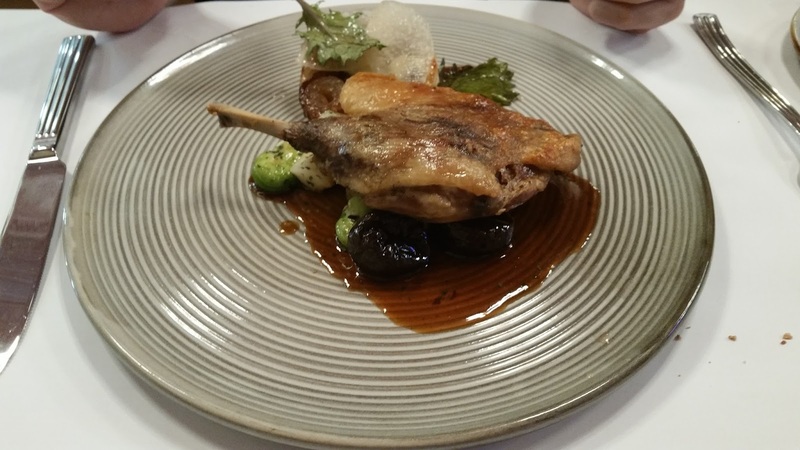 To my delight the duck skin was exceptionally crispy, with the duck meat maintaining its moisture and tenderness. The added caramelised onion took it to a new level, and I also really loved this dish. 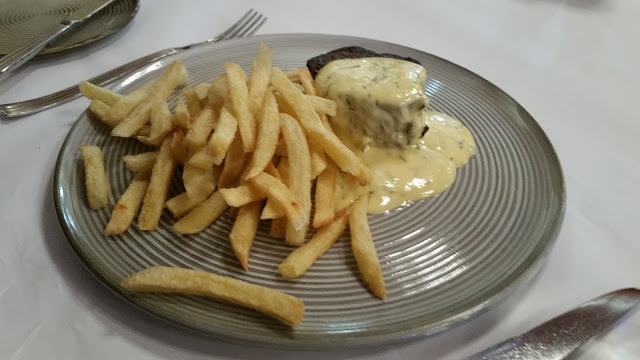 As my readers would know by now, my go to dish in a French restaurant is always the steak frites, so both my other companion and I had the Filet de Boeuf, Frites, Salade - an eye fillet served with green salad, homemade French fries Béarnaise or Green peppercorn sauce. My companion opted for the Bearnaise, whilst I had the Green Peppercorn. 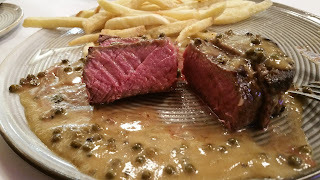 As usual, I had it cooked rare, and it was served perfectly rare. The steak had a meaty texture whilst it was still quite tender, for an eye fillet, I found it to have quite a strong beef flavour to it. 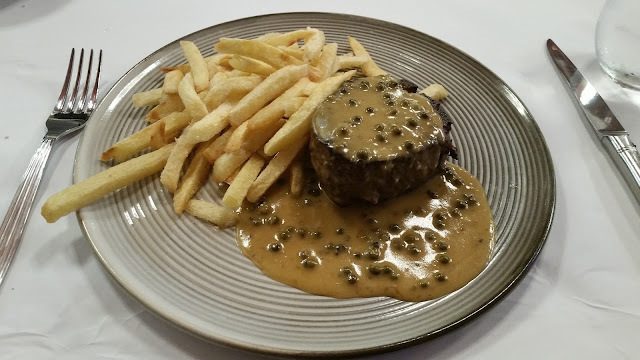 My companion mentioned that her Bearnaise sauce was rich and creamy, but I still preferred the sharpness of my green pepper sauce. The fries though were far thicker cut than we had imagined, being more akin to chips than fries. We thought that they could have been crispier and better seasoned, but still they soaked the meat juices and sauces well. 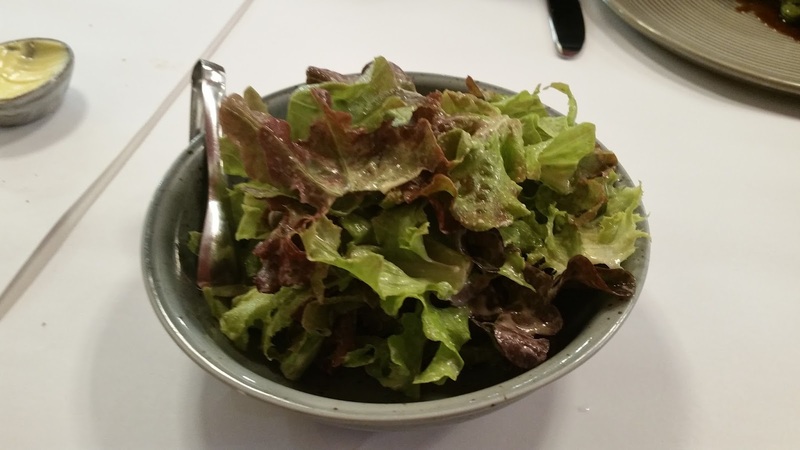 The salad to our steak frites came in a separate bowl. It comprised of lightly vinegar-ed leafy greens, which were refreshing but could have been a little more crunchier, perhaps if onions were added. 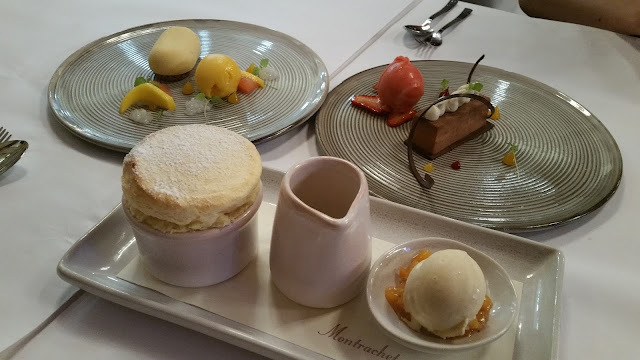 Being unable to decide between desserts, we opted for three to share. 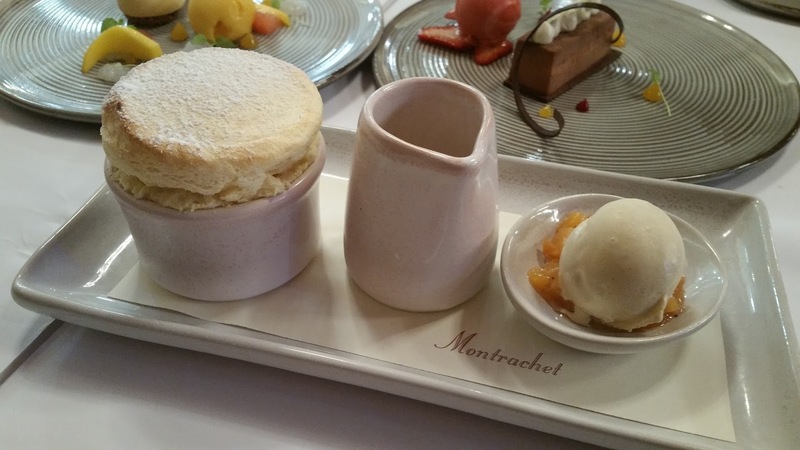 First up was the Soufflé d’abricot - Apricot soufflé, Tahitian vanilla bean ice cream, spiced peach compote. I was really impressed with how fluffy and delicate the souffle was, and appreciated the really light apricot and vanilla flavours. The spiced peach compote definitely had a stronger flavour, and we added it cautiously so as not to overpower the dish. 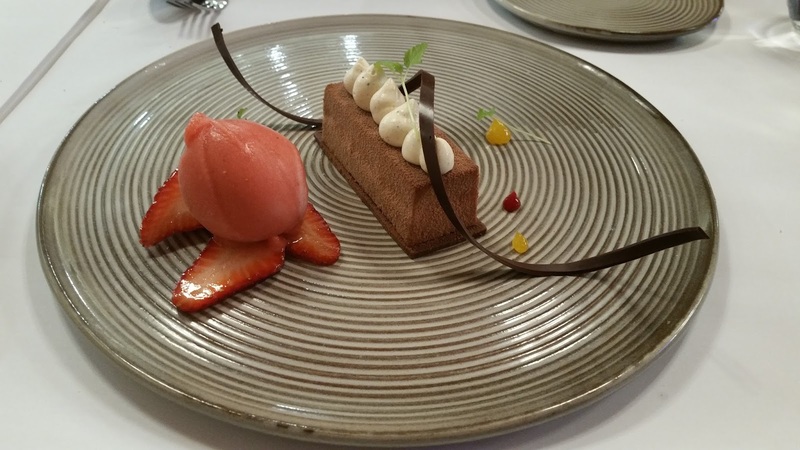 Next was the critically acclaimed Chocolat de Passion - Grand Marnier brulée, passionfruit curd, chocolate hazelnut praline mousse and strawberry sorbet. I found the combination of flavours to be very novel and they came together wonderfully. I especially enjoyed the rich chocolate hazelnut praline, which drew sharp contrast to the refreshing strawberry sorbet. Our last dessert was the Mousse de praliné et chocolat blanc - white chocolate and hazelnut praline mousse with mango and grapefruit, which was the crowd favourite that evening. 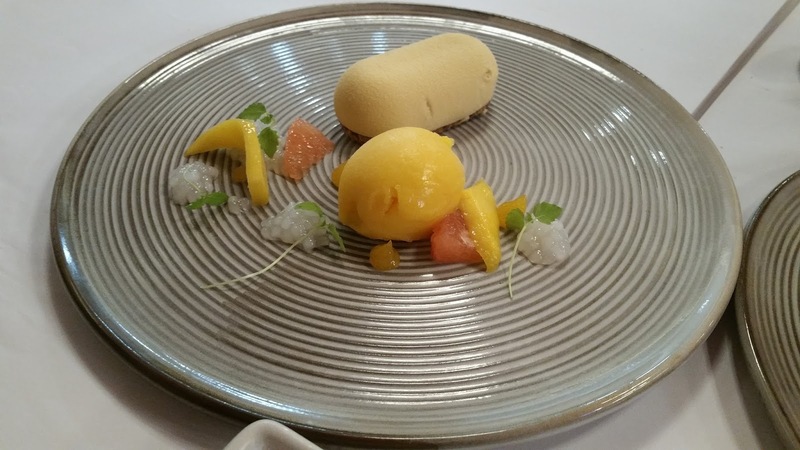 With the strong fruity focus of mango and grapefruit, the whole dish tasted like summer. I loved the chocolate and hazelnut praline which was smooth and creamy, coupled with the sorbet, it made for one hell of a dessert.